McDonald “Mackey” Bane received her MFA at Woman’s College (now UNCG) in 1959. She studied with Gregory Ivy, John Opper and Robert Partin. Ivy, founder of the Department of Art and the Weatherspoon Art Museum, was her most influential instructor, as well as friend and lifetime mentor. In 2002, Bane revisited the pen and ink drawing, 2000. 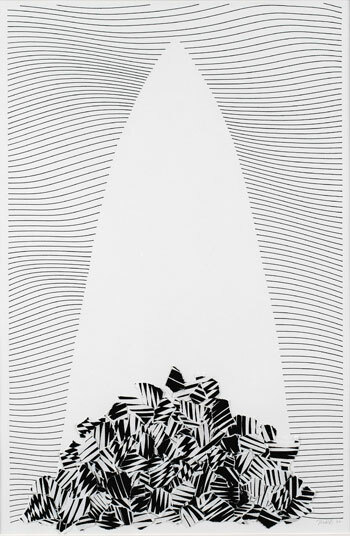 The new work, 2001, serves as a response to the events of 9/11. The shape in the center is collapsed, creating a void where a structure once existed. Bane’s vaired professional career includes instruction at Meredith College, California State University at Fullerton, North Carolina School of the Arts, and Southern Illinois University at Carbondale. She also served as curator for the Southeastern Center for Contemporary Art from 1977-80. Exhibited in over 180 local, state and national solo and group shows, her work is also found in permanent collections at the Museum of Modern Art in New York, the Weatherspoon Art Museum, the Mint Museum of Art, Duke University, Cameron Museum of Art, and the United States Department of State.